A Third Party Alternative To McCain? The same conservative Christian activist who called a meeting last fall to discuss backing a third-party candidate to counter a possible Rudy Giuliani candidacy is revisiting the idea as Sen. John McCain closes in on the Republican presidential nomination. Bob Fischer, a South Dakota businessman and anti-abortion activist, told The Associated Press on Wednesday that while he could back the Arizona senator over either Democratic Sens. Hillary Rodham Clinton or Barack Obama, he made clear that he and others in the evangelical movement are not content with those choices. "I'll be working in other ways to see that we have additional choices as conservatives," Fischer said. He declined to elaborate, but held out hope that Mike Huckabee might mount an improbable comeback, or that another "good conservative, Godly, Christian pro-life" GOP candidate somehow emerge to supplant McCain. The Arizona lawmaker has opposed abortion during his four terms in the Senate. Fischer also volunteered an alternative scenario: supporting the nominee of the fledgling Constitution Party. Although some conservative Christian activists are warming to McCain, Huckabee's success with that voting bloc in recent primaries and caucuses shows that much work remains for McCain. Several Christian conservative leaders dismiss renewed talk of a third-party strategy, but any significant loss of conservative Christian voters could spell trouble for McCain in a close general election. "Some of these folks might be trying to send a signal to McCain," said Mark Rozell, a political scientist at George Mason University. 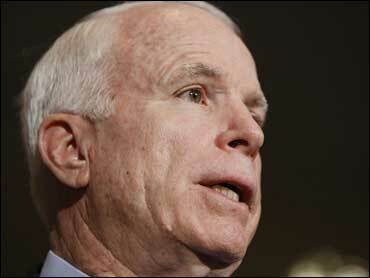 "There are also some people in that movement who believe McCain is hopeless. And they're not bluffing." McCain already faces danger if conservative Christians are not energized about his candidacy, and the prospect of a third-party candidate siphoning off even a half-percentage point of McCain support could be a difference-maker, Rozell said. Last fall, Fischer called a meeting in Salt Lake City as Christian conservative leaders attended a separate gathering of the ultra-secretive Council for National Policy, an umbrella group for the movement. Most attendees of Fischer's meeting, including Focus on the Family founder James Dobson, agreed to support a minor-party candidate if Giuliani emerged as the Republican nominee, according to Dobson and others in attendance. Another group suggested creating a new party, but no consensus emerged, Dobson wrote in an op-ed in The New York Times. Several Christian conservative leaders, speaking on condition of anonymity, said Fischer has invited them to a follow-up meeting next month in New Orleans coinciding with another Council for National Policy meeting. Fischer would not confirm nor deny a meeting, but said, "If I told you we were, I think the success of that meeting would be greatly compromised." Mat Staver, who heads the conservative Christian legal group Liberty Counsel, said blunting McCain with a minor-party candidate has scant support because McCain is much closer to social conservatives on issues than Giuliani. Former GOP presidential candidate and conservative Christian Gary Bauer, who endorsed McCain this week, also was dismissive: "I think the third-party idea has effectively gone the way of all bad ideas," Bauer said. Fischer said that for large numbers of social conservatives to entertain backing McCain, he would need to reverse himself on several positions, including his support for relaxing restrictions on federal funding for embryonic stem-cell research. Fischer said if McCain prevails short of doing that, he and many other conservatives "will not work as hard as we could" to elect him. He then raised the possibility of Christian conservatives lining up behind the Constitution Party, citing its conservative moral stances and ability to get on state ballots, a steeper challenge for an entirely new party. The Constitution Party, which calls itself "completely pro-life, pro-gun, pro-American sovereignty and independence," has secured spots on about 16 state ballots and hopes to exceed 40, national field director Gary Odom said. The party has nominated founder Howard Phillips as its presidential candidate in the past and will select its candidate in April. Said Fischer: "The Republican Party needs to remember that (the Constitution Party) will nominate a conservative. If the Republican Party wants to avoid defeat in November, they need to do the same. There are no votes to waste in this election."